Carpet tiles are small squares of carpet that you can install without going through the lengthy and laborious process of stretching carpet. Lowes, a national home supply center, sells multiple styles and colors of carpet tiles. Lowes may also provide some guidance on installation, although it is very informal. 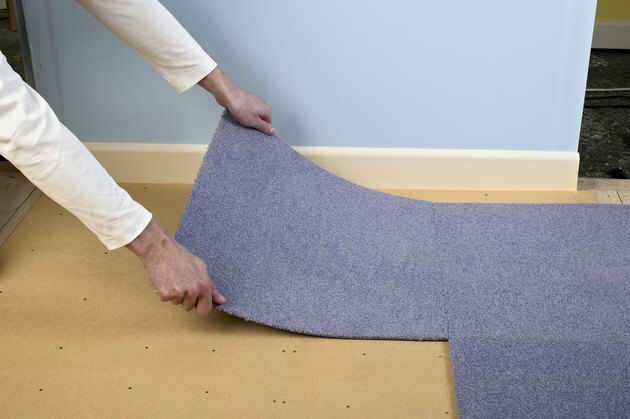 Like any homeowner project, laying carpet tiles will take some preparation and planning to ensure that the carpet goes down correctly and will remain a fixture in your home for a long time. Set the carpet squares in a room next to where you will install them. Allow the tiles to sit for 48 hours so they acclimate to your home's interior environment. Clean the floor before laying the tiles and patch any holes with concrete filler or wood patch depending on your subfloor material. Measure the length and width of the room to determine its center. Use a chalk line to mark along your measurements to have guidelines for laying the carpet tile. Use a square to ensure the center corners snapped by the chalk line are at 90 degree angles. Re-measure and re-square if needed. Using peel and stick Lowes carpet squares means an easy installation that most handy homeowners can take care of on their own. Installation should take about 15 minutes per square yard to install, not counting prep time. Lay four carpet tiles in each quadrant in the center of the room. Peel the backing from the tile and stick them carefully to the floor. Ensure the arrows on the bottom of the carpet tiles are pointing in the same direction. Surround the initial square of carpet tiles with another set of tiles and attach in the same manner. Continue to lay carpet tiles by surrounding the initial square with additional tiles. Do this until you lay all the carpet tiles. Roll over the tiles with a weighted floor roller to ensure no air bubbles exist between any carpet tiles and the subfloor. Vacuum the Lowes carpet tiles regularly at least once a week to keep looking fresh and feeling soft. Carpet tiles in rooms with heavy traffic will need a more frequent cleaning. Tend to any stains or spills immediately by blotting up any liquid and dabbing with a vinegar and water solution until the stain disappears. For heavily soiled carpets, use a carpet shampoo, following the directions on the label.